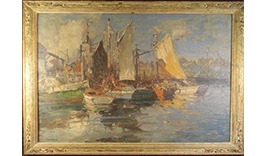 Live Online Bidding Available For 100+ Select Lots at www.LiveAuctioneers.com . Musical Instruments: Steinway & Sons Baby Grand Piano M342987 (Mahogany Case), 1938 Harmony Supertone Singing Cowboys Acoustic Guitar, 1950s Supro Electric Lap Steel Guitar w/ Case, Joseph Lorenz Schonbach ¾ Violin, Wood 21 Pipe Pan Flute & Moeck Maple Recorder, etc. Furniture: Two Qing Dynasty Wedding Beds, 19th C Opium Bed, 4 Asian Carved Wood Panels w/ Heavy Gilding, Adirondack Tangled Twig & Root Base Parlor Table, Federal NY Acanthus Carved Drop Leaf Sewing Stand, Antique English Carved Oak Barley Twist Caned Chair w/ Cherubs, Kindel Bardini Mid Century Regency Furniture (Headboard, 2 Night Tables, Triple Bureau & Mirror, Tambour Chest, Portable Mirror, Oval Dining Table, 4 Side Chairs, 2 Arm Chairs, Buffet), 8’ Ornate Burl Walnut Victorian Bookcase Secretary Desk, Fancy Victorian Walnut Parlor Organ, 6pc Walnut Depression Era Bedroom Set w/ Urn & Scroll Carvings, 7’ Drop Front Antique Walnut Bookcase Secretary, English 2 Door Walnut Armoire, Reeded Column Walnut Shaving Mirror, Walnut Empire Shaving Mirror, Antique French Style Leather Top Partners Desk, Walnut Mirror Front Inlaid Armoire, Art Deco Shell Base Console Table w/ Mirror Top, Single Drawer Notched Corner Walnut Stand, Walnut China Cabinet w/ Shell Carved Lattice, 6’ Walnut 2 Glass Door Book Case, Antique General Store Counter, Large Banded Dome Trunk, Ornate Cheval Mirror, Victorian Easel, 3pc Heywood Wakefield Cliffhouse Bedroom Set, Chicago Coins Clover Skill Pool Table, Sunshine Airtight Parlor Stove #16, Radiotower by Majestic Model 15 Radio with Telechron Clock, Large Antique Fireplace Mantles, Sunvision Pro 24S Wolff Systems Tanning Bed, etc. Collectibles: Estate Jewelry featuring (15) 14K & 18K Gold Rings set w/ Diamonds, Rubies, Sapphires, Emerald, Coral, Jade, Garnet, Lapis, Pearls, Amethyst & Other Gemstones, 10 Morgan & Peace Silver Dollars, Collection of Queen Lace Bohemian Crystal, Lalique Crystal, Eskimo Carved Soapstone, Brass Swan 3-Light Wall Sconces, Pr 15” Arts & Crafts Brass Candlesticks, Antique Cobalt & Emerald Green Glass Seltzer Bottles, French Alabaster Mantle Clock w/ Ormolu Mounts, Japanese Kutani Enameled Porcelain Vase, Carved Wood Rhino & Water Buffalo, Japanese Cloisonné Dragon & Phoenix Vase, National Cash Register Model 332, 2 Victrola Speaker Horns (Morning Glory & Ribbed), 5’ Chalkware Man Statue, Vintage Chalkware Blackamoor Genie Statue, Antique Wood Dough Bowl Trencher, Collection Vintage Tennis Racquets & Unopened Balls, Joan Sutherland “Designs for a Prima Donna” Signed LE Book, Chelsea Tambour Mantle Clock, Taj Mahl Bird Cage, Jacobs Bros Scale, Art Deco Ice Cream Parlor Syrup Dispenser Set, Asian Soapstone, German Steins, 2 African Carved Wood Masks, etc. Quality Additions Until Sale Time. for a complete catalog and photos!